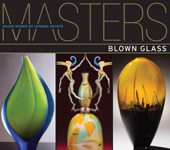 One of the common threads that runs through this beautiful book, Masters – Blown Glass by Lark Crafts book division, is the play of light and form that can only be achieved this spectacularly is with glass. Each of the artists included has their own distinct style and voice, but they also have a complete grasp of what they can achieve with such a versatile medium. Some of the names you may recognize and some maybe not. After you look through this book over and over, because there is always more to see with each viewing, you’ll come to know each artist and want to explore and investigate who they are and how they found their art. I’ve attempted glass blowing and found it the most challenging of the techniques one can use to manipulate glass, so I have more respect for what these artists achieve than most. I’d like to offer a Give-a-Way of a copy of this book to one of my readers that can name a well known glass blower that may just be in this book. I’ll give you a hint…Dale Chihuly is not in this book. The winner will be selected at random…good luck! I discovered glass blowing as a child. It was in a report I did on the state of NM. I was fascinated by it and always wanted to try. To name an artist? Dante Marioni?